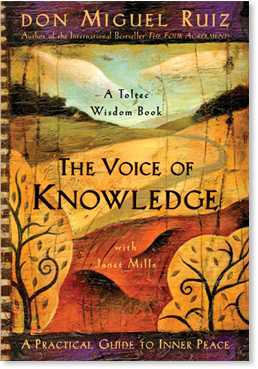 QUESTION: When I first saw the title of your new book, The Voice of Knowledge, I drew a conclusion about what it meant. I was surprised to learn that from your perspective “the voice of knowledge” is what you call “the liar in our head” that never stops talking. When you chose the title, The Voice of Knowledge, what message were you trying to convey? MIGUEL: I wanted to let everybody know about the real conflict that exists in humanity, and only in the human mind. All around the world people believe that there is a great conflict between good and evil. Well, it’s true that there’s a conflict, but it only exists in the human mind. It’s not true for the rest of nature. And the conflict in the human mind is not between good and evil. The real conflict is between the truth and lies. Good and evil are just the result of that conflict. Believing in lies creates all of the injustice, all of the violence, abuse, and suffering, not only in society but also in the individual. The voice of knowledge is the voice in our mind that is always talking — the voice that comes from all that we know. But that voice is usually lying because we have learned so many lies, mainly about ourselves. Every time we judge ourselves, find ourselves guilty, and punish ourselves, it’s because the voice in our head is telling us lies. Every time we have a conflict with our parents, our children, or our beloved, it’s because we believe in these lies, and they believe in them, too. So much of the knowledge in our minds is based on lies and superstitions that come from thousands of years ago. Humans create stories long before we are born and we inherit those stories, we adopt them, and we live in those stories. QUESTION: So the real conflict is that we grow up believing in the lies that we’ve been fed. I loved how you started the book with a different perspective on the story of Adam and Eve. It was a wonderful example of what you are talking about. Before we are programmed with knowledge, we are authentic. Can you speak about the authenticity of children? MIGUEL: We can say that Adam and Eve were like children before knowledge arrived in their lives. As children they were exploring and they wanted to understand everything. Even in this metaphor we can see that all of us are like Adam and Eve. We want to know. If we don’t know, we don’t feel safe, we don’t feel secure. Just to know, even if it is not true, makes us feel safe. That is why we believe in so many lies from so many people. How can we doubt what our parents teach us, or our teachers? We just accept everything they say, and without even knowing it, we create the whole story of our life based on lies. When we don’t understand how we create this world of injustice, we become victims of that injustice. We begin to search for what we believe that we are not. We begin to search for justice, we search for love. We search for everything we believe we don’t have, not knowing that everything we are looking for is already inside us. We are born with it. My first book, The Four Agreements, was an opening for us to start searching inside ourselves. With The Voice of Knowledge, we finish that search when we find ourselves, when we find the child that was there all our lives. At a certain point, we can no longer take anything seriously. All the lies are so clear to us and we can no longer believe them. Everything becomes clear, and we can be so happy after that point. It is the return to our childhood. It doesn’t matter how old we are, we never really stop being children. QUESTION: Having learned so much knowledge that is not based on truth, it can feel so impossible, so difficult to return to our authentic self — to the way we were as little children. What are some of the things we can do begin to recapture the child-like innocence that you are talking about? MIGUEL: We can start to become aware of all the lies that exist. Just to be aware is a good start. When we become aware that all these lies exist, then we become aware that truth also exists. Awareness is something that is very important. And you say that it looks impossible to become what we really are, to be authentic, to be ourselves again. But I will tell you that it is much more difficult to try to be what we are not. Just imagine that we no longer have the need to please other people’s points of view. You know, there are so many people around you, and they all have their own point of view. It is impossible to please all of them, but it is not impossible to please yourself. The only opinion that is really important for you is your own opinion. If your own opinion is not contaminated with lies, then that opinion becomes the only point of view that can take you back to the paradise that we lost a long, long time ago. QUESTION: There was a line in your book that I thought was so powerful. You said, “We create an image of perfection, a story about what we should be and then we begin to search for a false image.” We spend our whole lives trying to find that perfection and all we are doing is moving away from the perfection that already exists within us. MIGUEL: We are born perfect and we will die perfect. The problem is that we create that character in our story that we pretend to be, or that we want to be, and we cannot hide that from ourselves. We know that we are pretending to be what we are not in the name of perfection. We want to be perfect because our parents want us to be perfect, because the teachers at school want us to be perfect. We search for an image of perfection that isn’t real. It’s not truth; it’s the biggest lie. We will never be perfect from that point of view because that image is just an image — it is not real. In another little story about Adam and Eve, the snake asks Eve, “Do you want to be like God?” Of course, she replies, “Yes, I want to be like God.” But as soon as she says, “I want to be like God,” she has said that she is not God. Then she starts searching for God outside herself when the truth is that she is God. God is inside of her. She doesn’t have to look for anything at all, she just has to be herself. We humans create temples, we create rituals, we create all sorts of superstitions, because we are searching for God outside ourselves. QUESTION: Miguel, in The Voice of Knowledge you talk about the secondary characters in our story. Can you explain what you mean by that? MIGUEL: Well, we can say that our life is just a story that we create with the help of all the people who teach us to create stories. There is some story that we create, and we are living in that story. That story is made of characters. Everybody that we know is a character in our story. We create an image of our mother, our father, our beloved, our children, our friends, and the only thing we know about the characters in our story is the image that we create for them. We believe that we really know them, but the truth is that we don’t really know our father, we don’t really know our mother, we don’t really know our children. We only know what we believe about them, but it doesn’t mean that what we believe about them is true. Other people believe that they know us, too. For example, our mother can believe that she knows us very well, and she will tell the whole world that she knows us very well. But is it true that our mother knows us? No. She only knows what she believes about us. In the same way, we create the main character of our story, which is the image of what we believe we are. The main character is what we pretend to be, but it’s a big lie because we are not that, and we never will be. And the main character of our story has the need to talk, to communicate. The voice of knowledge is talking and talking and talking all the time in our head. But if we are the ones who are talking, then who is listening? The one who is listening is that child who learned every single word — an entire language. The part of us that is always listening is the voice of truth. It has no words, it has no sound, it is silent. It’s an expression of what we are before we are programmed with knowledge. When we recognize the voice of truth, we become what we really are. We become that truth, and at that point we are finished with ourselves. When we finish with ourselves, we no longer believe in all those lies. It doesn’t mean that we reject the main character of our story, no. The main character shifts completely and becomes our ally. Once we finish with ourselves, we can perceive the rest of the world just as it is. Just like magic we can understand everybody else. There is no longer any judgment, there is no longer any strong opinion. We accept all creation as it is because it is really our creation. QUESTION: I find the thought of being “finished with ourselves” intriguing. Can you say a little more about what it means to be “finished with ourselves”? MIGUEL: It means that we no longer pretend to be what we are not. When we become completely authentic, we no longer have any doubt. We find out that all the knowledge that lives in our mind is just knowledge, it is just a tool that we use in order to communicate with everybody else. You know, there was man who lived in Greece and who discovered this three thousand years ago. He was believed to be the wisest man in the world, and he spoke to the public and he told them, “I just know that I know nothing.” He came to that conclusion when he was over 80 years old. Well, we can come to that conclusion long before that because knowledge is nothing compared with the truth. Knowledge is just a way to communicate and to understand one another. It is a way to create agreements that we can use to create a more beautiful society. When we finish with ourselves, knowledge is just a tool for communication, and we put the rest of our mind to work for us, and we can create the most beautiful heaven wherever we are. QUESTION: Miguel, in your book you say that “respect is one of the greatest expressions of love.” I thought that was such a beautiful statement. Can you talk about the notion of respect as an expression of love? MIGUEL: Respect is an act of love that begins with yourself and it continues with everybody else. We cannot respect anybody else if we don’t respect ourselves. If we respect our creation and our dream, the story as we create it, then we return to our integrity right away. Once we respect the main character in our story, which is what we believe about ourselves, then it becomes so easy to respect everyone else’s point of view. Everybody has the right to believe whatever he wants to believe, to create his personal story the way he wants to create it. We don’t have the right to impose our point of view on anybody, but we have the right to share our point of view with others. And they can take whatever they want to take and reject whatever they don’t want to take. We know that people create their stories based on lies, but that is what they do and it’s okay. There is nothing wrong with that. When we learn to listen to what others say, and we don’t jump to conclusions, we can understand their story even if we don’t agree with their story. We can understand where they are coming from and respect their story. We can respect what each of us believes and know that each of us is dreaming our own dream that has nothing to do with anyone else. Just by having this awareness, we take a big step toward healing the mind, and this leads us back to love. QUESTION: You talk about the importance of perceiving with your feelings, and there is a line in the book where you say that “we don’t need internal dialogue; we can know without thinking.” What does it mean to perceive with your feelings? MIGUEL: Imagine that you are completely alone on a mountain and that you have the most beautiful view. You catch yourself telling yourself, “How wonderful is the view, how great are the trees, how beautiful is the sun.” You are talking to yourself as if you don’t know what you are perceiving. Once you find that the main character who is talking all the time is really coming from you, then you don’t have the need to hear the opinion of that main character. You see that without hearing that voice, you just perceive all the beauty that is around you, and that makes it possible for you to live in wonderful ecstasy. As soon as you start talking to yourself, even if you just say, “How beautiful is this flower,” in that moment your attention is not completely on the perception of that flower. If you don’t tell yourself how beautiful the flower is, then you just see the flower. You perceive the flower and you find out something very interesting—that you are one with that flower. You can see life coming out of that flower and you can see that this is what you really are. When you perceive with your feelings, you can see yourself in everything that you perceive. But as soon as you hear the voice talking to you about how beautiful everything is, right away your attention goes into trying to make a story about what you are perceiving. There is nothing wrong with that, really, but at that point you start separating a little from the ecstasy of just perceiving or just being there when all of your emotions merge with everything you are perceiving. At a certain point you no longer know if it’s your emotions coming out of you, or if it’s the beauty of all the perception that is coming from inside you. You find out that you are both. You are the whole merging; you are the ecstasy that is coming from without, and the ecstasy that is coming from inside you. I think this is something so beautiful, when you are able to perceive like that all of the time. MIGUEL: Nature is the power of our creation. You can see your body moving. You can see your mind thinking and creating the story. You perceive yourself living in your story and you see nature all around you. You can perceive the clouds moving in the sky, you can see the ocean, you can see that everything is alive and moving. There is no difference between you and the world outside of you. Both are a manifestation of the same power, which I call life. We cannot see life, we can only see the effects of life. The effect of life is the same in the flower; it is the same in your own body; and it is the same in your thinking and in your dreaming. When you stop all that thinking, and you perceive with your feelings, everything becomes a miracle and you perceive that there is no difference between anything — everything is one. Your point of view shifts completely from the individual to the general, and you see everything from a completely different point of view. You can see that everything is living in an eternal moment; it is happening and repeating itself all the time. It’s just a new way of perception, a new way of being. It’s not about being born and dying, it’s not about the transformation of energy. It’s about everything shifting at the same moment, going from one side of creation to the other — from becoming a human to becoming a dog, to becoming a flower, to becoming the wind, to becoming everything at the same time. You see that everything around you is delivering the message of life all of the time, in all directions. Everything we perceive is just a manifestation of what we really are, which is life. We experience complete ecstasy whenever we ago from one expression to another expression of ourselves. I think this is so beautiful. QUESTION: That was very beautiful. I want to ask you just a couple more questions. In your book you talk about faith, and what you said about faith is really important. Can you talk about the difference between blind faith and real faith? MIGUEL: Blind faith is when we believe in all those lies that exist in our mind. We believe in those lies and we will even defend those lies with our own lives. We go into what we can call “evil” without even knowing it. Let’s consider an example. The people who lived 800 hundred years ago in Europe had all these superstitions, they had all these fears that we can see so clearly now. They believed that if they don’t do what they believe they should do, they would be condemned. They lived with a lot of guilt, with a lot of shame. They were ashamed of themselves because they were not what they thought they should be. These were just lies, but they based their lives on these lies and they really had faith in these lies. That is a good example of blind faith. QUESTION: And then you talk about the power of real faith in our lives. MIGUEL: Well, real faith comes from the truth. Jesus said two thousand years ago, “You will know the truth and the truth will set you free.” Free from what? Free from all those lies that have troubled us for so long. Free to be yourself. Free to be authentic. Free to know the truth. And once you know the truth, your faith is no longer blind. You don’t believe all those lies. In that moment you are free, and you don’t even have words to explain what you really are and you no longer care about what you are. You just know that you are. In that moment everything is possible; there is nothing that is impossible. This is real faith. QUESTION: Miguel, the last question I want to ask you concerns a challenge that so many people face. It’s easy for us to look at the state of the world today and think that we are headed for more doom and destruction. What message from The Voice of Knowledge would you most like to share with our readers? MIGUEL: First, the most important thing is to stop believing all those lies that exist in your mind. Don’t believe yourself. Second, don’t believe anybody else, but learn to listen. Listen to the voice in your head, and only take what you believe is the truth. Let go of whatever you believe is not the truth. Listen to other people tell their story, but don’t believe them because it’s just a story that is only true for them. If you follow these two rules — don’t believe yourself, and don’t believe anybody else — all of the lies you believe won’t survive your skepticism and will simply disappear. The truth survives our skepticism, but we cannot say the same about lies. Lies only survive if we believe them. But when you finish with yourself, you no longer believe in all those lies. You understand, you have the awareness that you create the story, and that it’s okay to live in that story. The whole story becomes your life and you will use everything that you know in order to communicate and to express the beauty that exists within you. This means becoming yourself, and expressing yourself in any direction of creation. You will become better and better in the expression of what you really are when you take responsibility for your decisions. Be yourself, be authentic, don’t pretend to be what you are not. Enjoy yourself. Say, “I love you” to all the people who are around you — to your parents, to your beloved, to your friends, to your brothers and sisters. Give yourself — what you really are. And what you really are is love. Be yourself and don’t expect to receive love from anybody else. But when love comes from others, accept it, receive it, and enjoy it. Be happy always, beginning with yourself, of course. That is what I keep telling everybody: to create that beautiful heaven for themselves. QUESTION: I know that The Voice Of Knowledge is destined to be the international bestseller that The Four Agreements has been because it is filled with so much wisdom. I want to let people know that they can visit your website to get more information about all of your books and any programs that you are offering. And I want to thank you for sharing all your wisdom and love through the books you have written. Click here for more info on The Voice of Knowledge: A Practical Guide to Inner Peace. Copyright © 2004 by Miguel Angel Ruiz and Janet Mills.